Chris Froome is left with a tall task this weekend to overhaul Joaquim Rodriguez‘s overall lead in the 2014 Volta a Catalunya with just two stages of the race remaining. The Team Sky leader currently sits in sixth place overall, 17 seconds behind Rodriguez (Katusha). Between the two riders are other serious contenders also eyeing the win – Alberto Contador (Tinkoff-Saxo), Tejay Van Garderen (BMC Racing), Romain Bardet (Ag2r) and Nairo Quintana (Movistar). The entire top 10 of the GC is separated by just 48 seconds. Given his display to win stage three of the race in La Molina, Rodriguez is looking in good shape and it will be hard to beat him. Saturday’s stage is pretty much a write-off for the climbers, with just one third category climb at the mid-way point. Sunday’s final stage offers an opportunity – featuring a third category climb on each of the eight finishing laps in Barcelona. Unfortunately for his rivals, this stage plays to Rodriguez’s strengths – explosive speed on shorter ascents. As Froome showed at the World Championships in Florence last September, this sort of repetitive ‘minor’ climbing is not his strong suit. Although Froome was active on the two stages finishing with climbs – three and four to Vallter 2000 – he has looked off his peak form, and at times uncomfortable with the cold, wet conditions. Missing Tirreno-Adriatico earlier this month due to a back problem has left him without as many racing miles in the legs as some of the other Grand Tour contenders. With a Tour of Oman win already tucked away this year, he’s hardly struggling, but after last season’s performance we are used to seeing Froome dominate stage races at this level. Among Rodriguez’s immediate rivals it’s Tirreno-Adriatico winner Contador that seems the most determined and able to upset the Katusha leader. Even on Friday’s relatively benign stage, he put in an attack on the final climb to try and cut his four second deficit on Rodriguez. 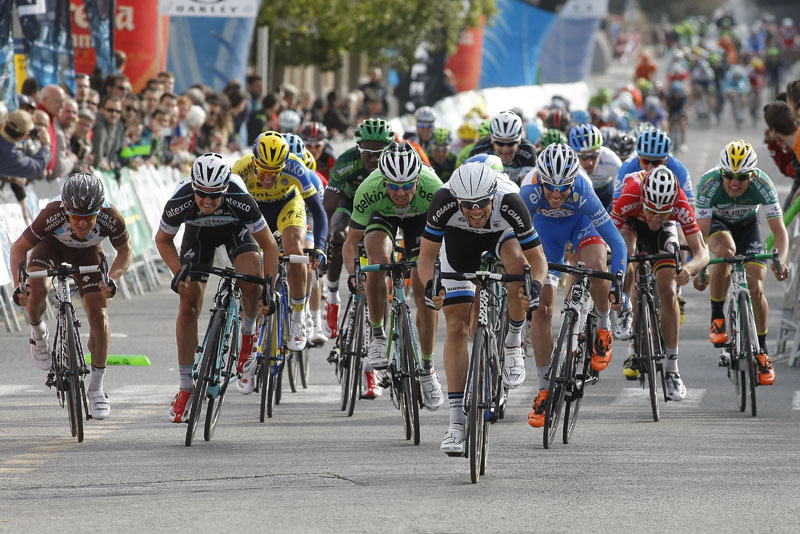 He even played a part in the final sprint, finishing sixth behind winner Luka Mezgec (Giant-Shimano). It was Mezgec’s third stage win in the race, as he edged out Julian Alaphilippe (Omega Pharma-QuickStep) and Samuel Dumoulin (Ag2r) in second and third. British first-year pro Adam Yates (Orica-GreenEdge) finished in seventh.